Pros: Got it running an Oculus Rift with 3 sensor setup well. My motherboard didn't have enough USB bandwidth for the oculus Rift sensor and I had already had to update several USB drivers manually, so when I installed this card I went to StarTech's site and downloaded the drivers for this board. However when I plugged my Rift sensors into the board I got red errors for very poor tracking. Later I plugged in a USB 3.0 HDD and got an error in windows that said, "This device can perform faster" which was weird, so I went into device manager and hand to manually update each of the USB controllers on the card (my first update had only updated one bus) The card seems to be working well now and my Rift tracking is much better. Pros: - In my opinion, none for that price. Cons: - The usb ports aligned in a way which does not fit to any typical computer case. - Supports only up to 32 xHCI endpoints in total. Pros: I bought this card so I could plug in three Rift sensors for room-scale VR, in addition to being able to have multiple other USB devices hooked up. Once the driver is installed everything works perfectly. I have yet to recieve any sensor error messages. Hopefully this lasts a few years. Cons: Haven't experienced any cons. Other Thoughts: Yes, the orientation of the USB ports on the card can make it a bit tricky in terms of clearance on the back of your case. Just make sure it's lined up properly and you shouldn't have any problems. It will install in a pcie x16 slot. Thanks for sharing your review. We're very sorry to hear the product arrived damaged. We'd like to replace it for you right away. Please contact us directly by phone, email, or live chat and we would happy to assist further. 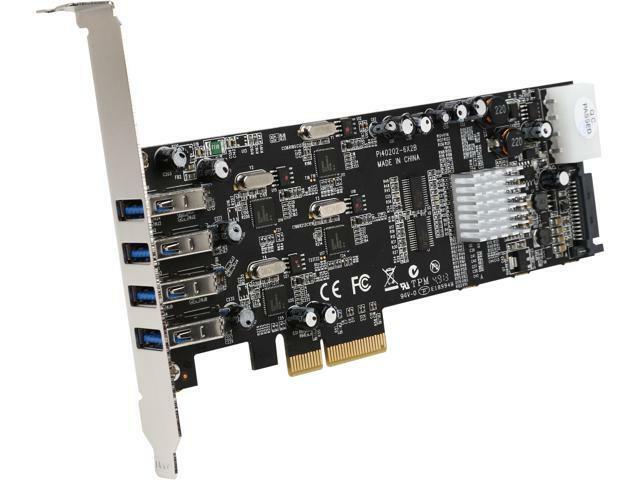 Cons: uses a very outdated PCI-E x4 slot thus fairly makes this card fairly useless in any modern computers esp if you looking at this for VR. Pros: Bought it specifically to run multiple Kinect2s on one PC with libfreenect2 under Windows. Works perfectly, all four K2s run at 30fps. Works under Win7 x64, Win8.1 x64, and Win10 x64 plug-and-play. I think the bad reviews about compatibility are older and those issues have been fixed. Cons: One minor negative is that since the USB3 ports are horizontal, you have to make sure the card is lined up properly or it can be hard to plug into. A minor hassle though in order to get four independent ports in a half-height card. Other Thoughts: Have not tried using this card for other things like outboard disk drives, so cannot speak to its performance there. Pros: Allowed high speed copy to from USB3 devices on same adapter unlike the x1 four and seven port adapters I tried. The chipset, Renesis, is also compatible with VIA USB3 adapter chipset. Was able to burn blue-ray from external 6TB USB3 drive to external USB3 Asus blue-ray recorder at full speed. Cons: Did not have that 20 pin socket for connecting to front panel USB3 nor did it have eSata option. The 4 USB3 sockets are horizontal and the plugs need to be wiggled in. Other Thoughts: I put this in the 2nd x16 slot. The first x16 slot has GTX1070. The system I have this in also has an x1 slot and I put in a VIA chipset USB3 as that adapter had the 20 pin socket for my top case panel. Both adapters work fine together. The motherboard is rev 1.03 and I put in a socket 771 zeon with that 775->771 adapter. The PCI slot has an SiL 3124 eSata port multiple. All boards work fine. Cons: Spent days chatting with support and trying to get it working on MSI X299 ACK 7 - no joy.